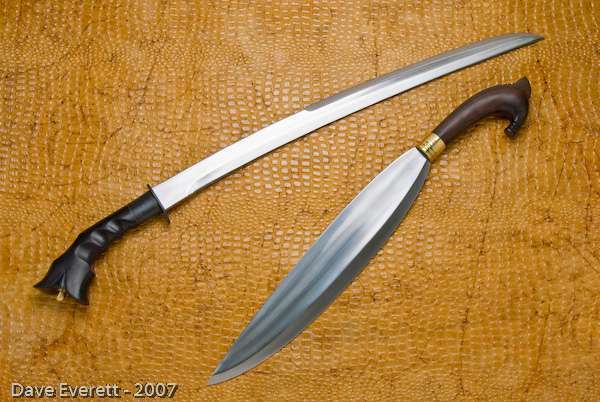 The Sansibar Sword, sometimes mistakenly known as the Zanzibar Sword. 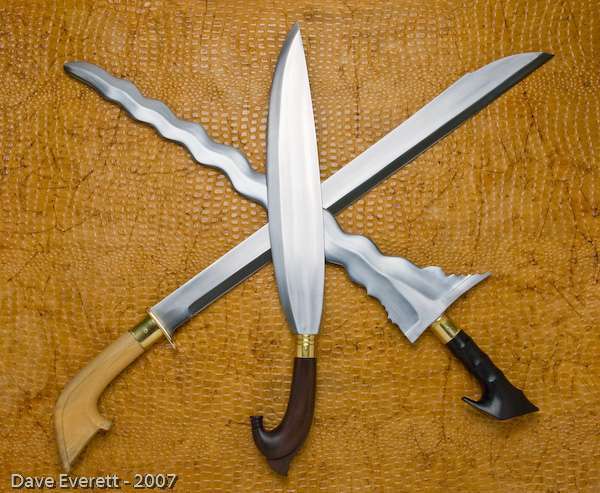 The Zanzibar sword, which is an African sword, mainly from around the Saudi Arabian/African border line area. If there is a historical connection between the Filipino version of the Sansibar and the Zanzibar, it is presently unknown! The Sansibar was officially born in Leyte in 1881 before Spain sold the Philippines to America through a treaty. Mainly the sansibar was and still is used by the river men who cut bamboos and use it as floaters for their "bangka" or boats for local traveling. These same boatmen also travel the seas to cross to the other islands in the Philippines. That is the reason why the Sansibar design reached other islands within the Philippines. You will see various popular designs of the Sansibar sword...approximately 5 different designs in the various islands where the Sansibar had found a home. The name Sansibar was first called "pang sibak", which "pang" means "for" and "sibak" means "chop" in Filipino term. So pang sibak means "for chopping," later the term evolved into "pang sibar" which means the same in Tagalog. Other explanations are "san sibak," meaning "one" (san or isan or isang) and "chop" (sibak) so to put them two words together "san-sibak" means "one chop!" Then much later on the name sansibar was adopted even though every Filipino dialect differs in almost every island. The hearing and the pronunciation of the word "Sansibar" changed until the occupation of America began...and then the word Sansibar was used as the standard name for this particular sword design. This history is one strong theory supported by strong beliefs of the Filipino people. Any other history of this sword is not well known because a more popular swords like the " K atipunan" and "Pinute" were used by the katipuneros. Those swords are widely used in everyday tasks as tools of survival, and the Sansibar whose image, shape and style was temporality put aside. 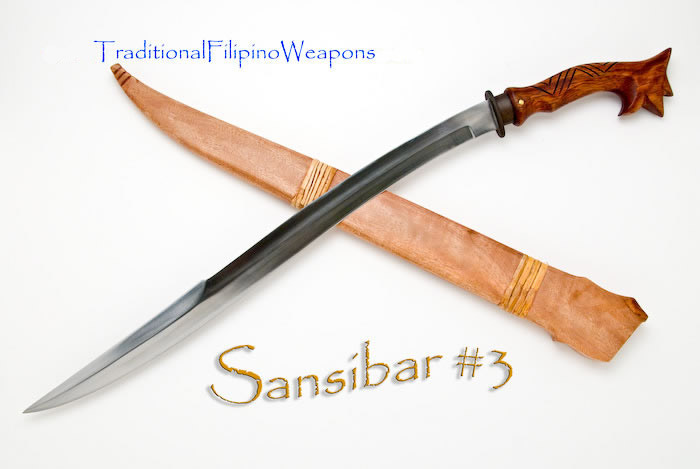 But then again, the Sansibar was also used by many of the katipuneros for all out combat purposes due to its perfectly engineered balance. "These long swords are forged to obtain flexibility because of their length. Normally, the dangers of a long sword, such as the sansibar, is that you may never know when it is going to snap into two. So we created a solution to this problem by making it flexible enough to avoid such accidents. The sansibar is used basically only as a weapon, and not for farming or industrial use. Chinese weapons, such as the wushu sword, and other flexible swords, are used in a specialized manner (such as techniques of maneuvering the wrist) to avoid bending. Flexible swords are not meant to be used against hard, inanimate targets. For combat use, only the vital parts of the body are the targets for such swords. Using the sansibar outdoors for chopping trees or the bones of game, are incorrect uses and will not maximize a flexible sword's usefulness. The proper use of this sword begins with techniques of moving the wrist with proper execution which takes some practice prior to using it for everyday chores."